Apartments for your well-being in Algund near Meran, spacious wellness area & countless activities in the environs. 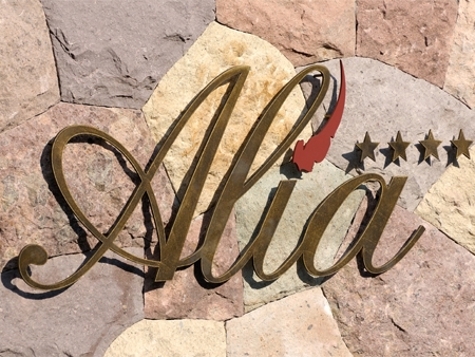 Welcome to Alia Vital Appart-Hotel**** in Algund near Meran! You can do everything, but you don’t have to do anything! In our Alia Vital Appart-Hotel**** in Algund near Meran you have the choice. At your whim you can prepare your breakfast yourself or sit down at a laid table, enjoy our dishes from 3 pm to 7:30 pm or cook your own meal. No constraints, no appointments, no hurry, after all it’s your holiday. For your perfect wellbeing we provide modern and comfortable apartments with balcony and/or terrace, satellite TV, radio, phone, internet access, safe, hairdryer and air conditioning. Moreover, you will find towels, cuddly bath robes and slippers. At your disposal is also a spacious spa area with indoor pool, beauty- and relax zone. The nearby village centre, the city Meran and the nature park Texelgruppe offer many cultural and sporting activities. In the holiday region Algund you will find all year round various opportunities to enjoy your leisure time. Experience the new way to be on holiday and to enjoy consciously! Apartment Type E – Size 37 m², West-Side with 2 balconies: One-Room-Apartment with 1 double-bed, kitchen-corner completely fitted out with all you need, dining-table, couch, satellite-TV, radio, telephone, free internet connection/WiFi, air conditioning, safe, bathroom with shower, WC and bidet, hair-dryer, towels, bathing-gowns and slippers. Apartment Type F – Size 37 m², North-West-Side with balcony and terrace: 1 double-bedded room, kitchen-living-room completely fitted out with all you need, dining-table, couch, satellite-TV, radio, telephone, free internet connection/WiFi, air conditioning, safe, bathroom with shower, WC and bidet, hair-dryer, towels, bathing-gowns and slippers. Apartment Type B – Size 44 m², South-East-Side with big balcony: 1 double-bedded room, kitchen-living-room completely fitted out with all you need, dishwasher, dining-table, couch, satellite-TV, radio, telephone, free internet connection/WiFi, air conditioning, safe, bathroom with shower, WC and bidet, hair-dryer, towels, bathing-gowns and slippers. Apartment Type D – Size 44 m², South-West-Side with big corner balcony: 1 double-bedded room, kitchen-living-room completely fitted out with all you need, dining-table, couch, satellite-TV, radio, telephone, free internet connection/WiFi, air conditioning, safe, bathroom with shower, WC and bidet, hair-dryer, towels, bathing-gowns and slippers. This type is a modern one, and it has elements of glass and a glass door between the bedroom and the living-room. Apartment Type A – Size 46 m², South-East-Side with big corner balcony: 1 double-bedded room, kitchen-living-room completely fitted out with all you need, dishwasher, dining-table, couch, satellite-TV, radio, telephone, free internet connection/WiFi, air conditioning, safe, bathroom with window, shower, WC and bidet, hair-dryer, towels, bathing-gowns and slippers. Apartment Type C – Size 50 m², South-East-Side with big balcony: Modern flat with doublebed, separate kitchen completely fitted out with all you need, dining-table, couch, satellite-TV, radio, telephone, free internet connection/WiFi, air conditioning, safe, bathroom with shower, WC and bidet, hair-dryer, towels, bathing-gowns and slippers. Apartment Type G - Size 65 m², South-East-Side with balcony and terrace, 3rd floor: 2 double-bedded rooms, kitchen-living-room with dish-washer and completely fitted out with all you need, dining-table, couch, satellite-TV, radio, telephone, free internet connection/WiFi, air conditioning, safe, bathroom with two wash-basins, shower, WC and bidet, hair-dryer, towels, bathing-gowns and slippers. Apartment Type H - Size 70 m², South-East-Side with balcony and: 2 double-bedded rooms, kitchen-living-room with dish-washer and completely fitted out with all you need, dining-table, couch, satellite-TV, radio, telephone, free internet connection/WiFi, air conditioning, safe, bathroom with two wash-basins, shower, WC and bidet, hair-dryer, towels, bathing-gowns and slippers and a second lavatory. Apartment Type I - Size 85 m², South-West-Side with balcony and: 2 double-bedded rooms, kitchen-living-room with dish-washer and completely fitted out with all you need, dining-table, couch, satellite-TV, radio, telephone, free internet connection/WiFi, air conditioning, safe, bathroom with two wash-basins, shower, bathtub, WC and bidet, hair-dryer, towels, bathing-gowns and slippers and a second lavatory.